No, your eyes are not deceiving you. For the first time in franchise history, the New York Mets are 10-1 to start the year. While we’re only six percent of the way through the 162-game marathon that is the regular season, I can already feel that the majority of this fanbase is struggling with whether or not to allow themselves to believe. Mets fans have been burned before, as you don’t have to look any further than last year when the club went from World Series expectations to a dismal 92-loss season. Prior to that, the 2006 squad that won 97 games fell short in the postseason, while the 2007 and 2008 teams couldn’t even make it to October thanks to back-to-back September swoons. And it’s not as if we haven’t seen this kind of thing in the past. Last year’s team started the season 7-3 before injuries and poor performances became overwhelming, leading to six months of mediocrity. Hell, even the 2012 Mets had a 31-23 record in June and that team wound up losing 88 games that season. Strong starts, especially in baseball, are not always indicators of future success. We’ve seen it time and time again. But there are valid reasons why Mets fans may be able to let their guards down and believe in what they’re seeing. This team might just be for real, and not just an April mirage for a fanbase dying of thirst. When a team gets off to a start such as this, the detractors (or even just realists) will suggest that the team has been fortunate and that everything’s been going right. With the 2018 Mets, however, that actually hasn’t been the case. In fact, a lot of things haven’t gone right for this team so far. Noah Syndergaard and Jacob deGrom, the aces of the staff, have combined for a 3.48 ERA with neither of them throwing a single pitch in the seventh inning. Yoenis Cespedes, the team’s premiere offensive threat, is batting .178/.274/.400 while striking out in 39.2 percent of his plate appearances and has been dealing with the flu. Anthony Swarzak was placed on the disabled list just three games into the season. Power-hitting newcomer Todd Frazier has yet to hit a ball out of the yard. Jason Vargas, acquired to stabilize the starting rotation, has yet to throw a pitch for this team. These are all things that you can easily expect to sort themselves out, especially when looking at the career trends for each of these players. This isn’t to say that nothing has gone right for the Mets, as their bullpen has been stunningly effective to start the season, posting a 1.49 ERA (second best in MLB) as a unit. Michael Conforto returned from injury nearly a month before originally expected and has looked as healthy as ever. Adrian Gonzalez, who many people (myself included) completely counted out after a horrendous spring training, has come through with several key hits while posting an .810 OPS early on. Hansel Robles, despite him still scaring me half-to-death in every appearance, looks like he might actually be a legitimate reliever. Even Matt Harvey and Steven Matz have shown signs of life thus far. Even if you take a look at the club’s pythagorean record, an estimate of a team’s winning percentage based on runs scored and runs allowed, the Mets are 8-3. That suggests that while they may have been somewhat fortunate to win a pair of extra games thus far, this is still a good baseball team. By comparison, the Boston Red Sox, who are off to a 10-2 start, also have a pythagorean win-loss record of 9-3. Seemingly every time they find themselves knocked down, they’ve gotten up and punched back. 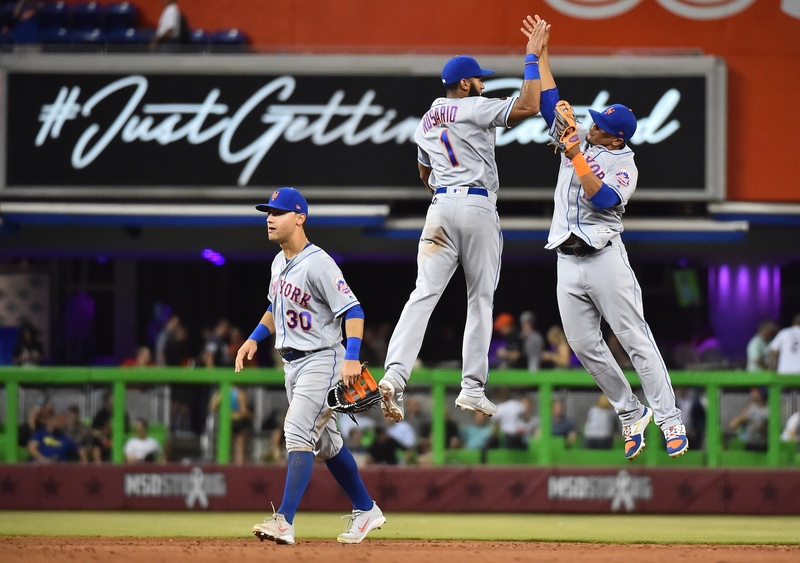 Their resiliency has been on full display early on this season, as was on display in the team’s dramatic 8-6 victory over the Marlins on Tuesday where they overcame two late deficits before pulling out the win thanks to a go-ahead, two-run double by Yoenis Cespedes in the 9th inning. That’s just something you can’t teach. Something you can teach, however, is the aggressive base running that the Mets have shown in every single one of their games this season. That is an element that we haven’t seen from this team in the past, but one that first-year manager Mickey Callaway has implemented with a rousing level of success early on. This team may not have much speed on their roster but their level of aggression on the bases, whether it’s advancing to second on short wild pitches or challenging the arms of outfielders to go first-to-third on base hits, has been a breath of fresh air and is leading to run-scoring opportunities that the Mets haven’t had in years prior. Let’s state the obvious here: The Mets are not going to continue winning 10 out of every 11 games this season. That would result in a 147-15 season. Mickey Callaway isn’t going to push the right button every single time he makes an in-game decision. The bullpen won’t be completely bulletproof all year long. But this Mets roster has the look of a team that has what it takes to win. The core of this roster is not all-that-far removed from a World Series run in 2015 and an unlikely, albeit brief, postseason appearance in 2016. They’ve added a manager who has the pulse of this team and the know-how to run it, they’ve got a group of players that is bonding and buying in to the message and they have the talent to win baseball games — even ones that they have no business winning in the first place. Yeah, fans have been burned before. And maybe despite everything they’ve seen, they’ll get burned again. But something tells me that this year might actually be different. This may just be the year where Mets fans can allow themselves to dream again.